The current owners researched period landscaping and restored the landscaping and gardens, which were originally designed by renowned 19th century American landscape architect and author Ellen Biddle Shipman. DARIEN — Did you ever see something and feel as if you just had to have it? The updated antique colonial house at 40 Swifts Lane is so alluring that it evoked that feeling for two families, one in the 1920s and the other nearly a century later. For Dorothea Abbott Swift and her husband, Dr. Walker Ely Swift, is was “love at first sight,” according to an article Dorothea wrote for a publication called The House Beautiful in August 1928. 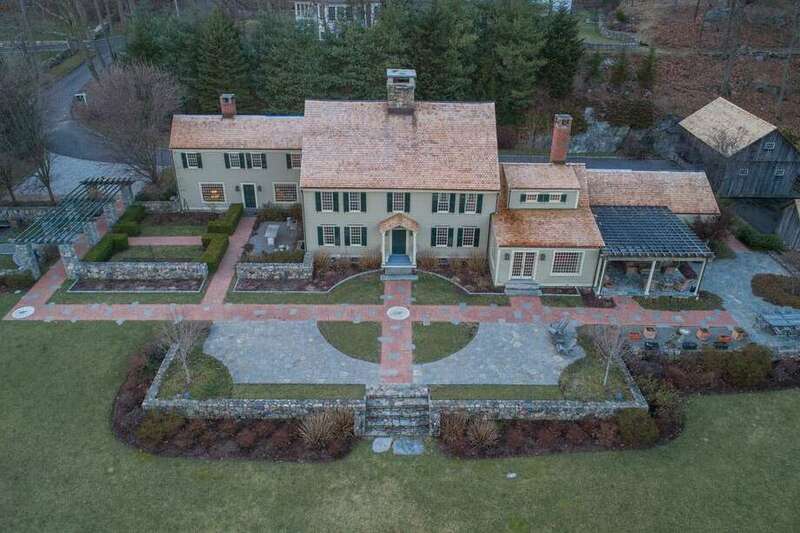 The updated antique colonial house is beautifully positioned on a 2.4-acre level waterfront property with more than 500 feet of frontage along Gorhams Pond, but that is not where the house was when the Swifts first saw it. The Hicock-Shelton House was originally built circa 1719 by Colonel Benjamin Hicock in the town of Southbury, some 50 miles from where it now stands. “Southbury was too remote from New York for our needs,” Dorothea wrote. Three years later the house was still on the market and the Swifts decided “we wanted that house to live in more than any one we had ever seen.” In 1927 they hired Elie Comeau of Dorchester, Mass. to dismantle the house, move it to the Darien site in 18 truckloads and reconstruct it at the end of a cul-de-sac. Some of the more delicate components were transported on a pile of hay. Dorothea’s account claims Comeau committed to memory every timber and other parts of the house, not marking any of the pieces. “If anything had happened to Mr. Comeau during the moving (and rebuilding) the house would still be a pile of old lumber, I am afraid,” Dorothea wrote. Fast forward about 70 years and another couple also fell in love with this house at first sight. Builder Joe Pagliarulo and his wife Margie were ice skating on Gorhams Pond in the winter of 2000. They were looking for a new house and even though this one had fallen into serious disrepair over the decades they had to have it. “We walked into the keeping room and our eyes popped out of our head … (We decided) let’s give it a new lease on life for the next one hundred years,” Pagliarulo said. With the Pagliarulo’s meticulous expansion, restoration and modernization this vintage house now comprises 5,242-square-feet of living space and sits at the intersection of 18th century charm and 21st century technology. It truly is the best of both worlds. This truly unique “smart” home, with all newer mechanicals, has been shored up from its stone foundation right up to the new cedar roof, the co-listing agents said. “We wanted to preserve it but fully modernize it with today’s creature comforts. We basically took it apart and put it back together again (for the second time in its existence),” Pagliarulo said. Left intact are the unusually-positioned wide chestnut floor boards, reclaimed chestnut cabinets, centuries-old overhead hand-hewn beams, original hardware and other original features. The paneling in the formal living and dining rooms are pegged. There are no nails. The balusters are hand-carved and hand-turned, Pagliarulo said. The keeping room features an eight-foot stone fireplace with its original 11x3-foot hearthstone. Throughout the home there are seven other fireplaces, one in the master bedroom suite. They gave each of the five remaining bedrooms their own full baths. They added a wine cellar and tasting room to the basement. Throughout the whole house they added reproduction electrified lighting fixtures that are exact replicas of 18th century fixtures. They also added to the property a barn from Litchfield County, which, like the house, was disassembled and reassembled on site. They researched landscaping of the period and restored the landscaping to its original glory, following the principles of Ellen Biddle Shipman, a renowned 19th century American landscape architect and author. Pagliarulo found out only afterward that Shipman had designed the original gardens there for the Swifts. They added a new water feature to the sunken garden. The rooms at the rear of the house have doors, some of them French doors, to the beautiful gardens and yard with views of the pond and the iconic Ring’s End Bridge. For more information or to make an appointment to see the house contact Maggie Marchesi or Bob Marchesi of Houlihan Lawrence. Maggie at 203-249-1433 or mmarchesi@houlihanlawrence.com, and Bob at 646-265-2846 or bmarchesi@houlihanlawrence.com.